Dog fences are a big business. Invisible fences are one of the reasons for this. The invisible dog fence has grown tremendously in popularity in recent years and represents the leveraging of technology to solve an age old problem: how do you keep your dog from getting out of the yard? This became a big problem with dogs that would jump out or, more commonly, dig their way out. The good news is that Pugs are not known as diggers. They are more likely to squeeze their way through openings in a fence than to dig under one. There is no doubt that once a Pug gets loose you have a problem. They can get so distracted that they don’t answer to their name. A Pug loves to be outside and finds a lot of things in nature tremendously exciting and interesting. They love a good walk and sniff session. Unless you have a very sturdy “air tight” fence almost any dog will find their way out over time. Pugs, although less likely than most breeds to dig their way out, will escape through an opening you didn’t think they could possibly get through. So many people have turned to invisible fencing. Invisible fences work with wiring that is put underground by professional installers or by you. A collar worn by your dog will send him a little shock when he gets close to the wire. Some have compared this to the static electricity shock you feel when you walk across a carpet and touch a doorknob. It will not harm your pet. There are many different manufacturers of these types of fences. You can usually find someone locally to install it and train you and your dog in its use. Another alternative is to buy the equipment and do the work yourself. To see one of the best and most reasonable companies in this area Click Here. This can save you some money. As we noted earlier, dog fences have become a big business. It should be noted that this type of fence will keep your Pug in your yard but it will not keep other animals out. It will also not keep people out. There have actually been reports of people going up to a dog and removing its collar. If your dog is a night barker be warned that this is a distinct possibility. Your little guy's barking may have annoyed a neighbor one too many nights. You may want to look at your Pug's behavior problems more closely. Looking Beyond Invisible Fences to investigate Advanced Dog Training may be your answer. 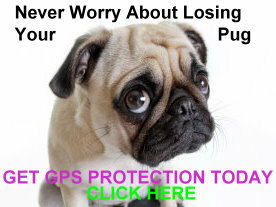 With the technology available today, it's even possible to have a GPS System that will keep track of your Pug if he does happen to get out. This is the ultimate in calming your fears about ever losing your best friend. It's definitely something to consider. After all, Pugs are not a small investment and they become a very big part of your life very, very quickly!